A Japanese friend who used to live in the Washington, D.C. area told me that I should check out Daruma, a small Japanese grocery store in Bethesda. We finally made it up there last weekend. Before we went shopping, we ate some decent ramen at Ren’s Ramen (the signs said “Sapporo style”), which is attached to the market. Memories of a freakishly delicious encounter with ramen in Sapporo made my mouth start watering when we parted the noren and peered into everyone’s bowls. The pork broth ramen was delicious, especially with a little pat of butter, corn kernels, and bean sprouts, which is indeed Sapporo style. Note: old reviews of Daruma mention a varied Japanese menu, now they serve ramen and gyoza. 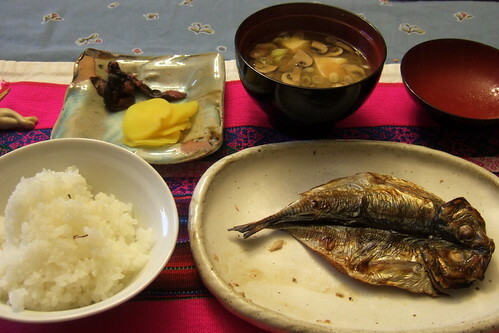 Photo: Back home I made grilled aji (horse mackerel), rice, takuan and nasu pickles, miso soup. If we shopped for 30 minutes, it wasn’t because we had far to go or much to see. The shop is small and there is not much variety. Yet there were good products and we found everything we wanted, katsuo bushi for stock, fresh unlabeled tofu (as in someone makes it locally), various pickles (takuan, the yellow daikon pickles, aka-jiso nasu-zuke, eggplant pickles tinted with red shiso leaves), and a few surprises: a bottle of good sake, two bags of my favorite Uonuma koshi-hikari rice, and frozen aji hirakiboshi (whole, split-open, lightly dried horse mackerel). I glazed my pleasure by speaking a bit o’Nihongo (“May we pay with a credit card?” never sounded so good) and tra la la off we went. Next we stopped at a miraculous place that sells wine and beer AND booze in the same store! Thanks D.C.! We bought booze at Burka’s Wine & Liquor Store—a wonderful land where where one may buy wine and liquor under one roof, in large, overindulgent mixed cases. “Do we have enough gin?” Then we drove back to Virginia, land of the (unvoiced linguolabial trill) ABC store. Tonight I made my man grilled aji with all the fixin’s. I’ve written about this kind of meal before. Life is good. We so enjoy these posts…wish you were here in Amsterdam to lead us to some good restuarants. Chinese duck is good..Vietnamese is loathsome ..Japanese non-descript. I was hoping Tyler had an Amsterdam posting but no luck..
Of course.. and the light goes on.. I just haven’t been able to take those tails and drop those little buggers down my throat. Dark beer, as you know, I love. Well. off to Brussels.. yum,yum! If you are a tofu fan, you should go to Thanh Son Tofu in Eden Center. It’s a Vietnamese store (the entire shopping center is Vietnamese), but my Japanese friends who have had their tofu love it. They make it in house; you can buy it very fresh, as in still warm. Madam says: Thanks for this! We were just over at Eden Center the other day. Will check out the tofu.